While I was taking clutter from the living room and dumping it in the dining room cleaning up the living room for new pictures this weekend, I was overwhelmed with love for my rug, and decided to do a post on how awesome it is. In reading other people's blogs, I understand that a rug is one of the most maddening elements of a room. It can make it or break it. It has to be perfect, but can also be the cost of a mortgage payment. I hear you. I knew right when we put an offer in on our house that I wanted, nay, NEEDED, the Pottery Barn zebra rug for our living room. I agonized over the price, but my mom convinced me to buy the 8x10 - for $633 including tax - immediately upon closing because her wool rugs are still going strong after 10 years. When we finally got the living room all arranged, I was in love. I love looking at the soft pile getting fluffed up while vacuuming (with my amazing 30 year old vacuum) and marveling that a year later it still looks new. Many people balk at the price of wool rugs, but let me tell you...IT IS SO WORTH IT. Fibers - Wool pile will 'bounce back' after a good scrubbing, lots of foot traffic, and general wear. Synthetic fiber rugs are stain resistant and offer more vibrant colors than wool, but a cheaper synthetic pile will mat down over time. Wool rugs are softer and 'springier' under your feet - and they stay that way for decades if regularily cleaned and vacuumed. Damage - Wool rugs can handle loops being pulled out better than synthetic rugs. You snip off the yarn and immediately, you can't tell where it came from. Well-made wool rugs are packed tight and stand up to losing threads here and there. Many synthetics can look 'bald' when this happens too often. Also, my cat peed a few separate times on my dining room rug (a horrible ongoing problem in itself) and it still looks great after an extensive remedy that included soaking it with urine-off and blotting it dry for days. Cost - Some people think it's crazy to spend $600+ on a room-sized rug, but I say you get what you pay for. I went the cheap route for the guest room, I got a sythetic rug for $100 and it's dropping threads like crazy and just generally isn't holding up. And we don't even use that room! Now, I only buy wool and if I want it brand new, I pay the $600 dollars. I particularily love Pottery Barn's rugs because they are extremely high quality for the price, and they have beautiful colors and patterns. If you think the price is high, do some research and it will start to look like a screaming bargain! My dining room rug was a PB 8x10 purchased gently used on eBay, and I am so pleased with it. I paid $240 including shipping, which was a steal for the size. I have also found high quality wool rugs at TJ Maxx/Homegoods for a fraction of this price, but I wouldn't buy cheaper priced wool online unless I was familiar with the quality. Pads - I never buy expensive rug pads, I go to TJ Maxx or Homegoods and pay about $20 for an 8x10 rubber non-slip pad. The key is to get the rubber pads with the TIGHT weave, not the ones with the big spaces in between. You don't need the $60+ rug pads the stores try to sell you, the rubber ones work just fine and won't ruin hardwoods. Care - I vacuum all the time because I have two cats, but even without the cats, I would vacuum at least weekly to keep the pile lifted and fresh. Wool rugs will shed for awhile after you buy them, but the high quality rugs won't shed as much as cheaper ones do. Bottom line - I view rugs as an investment, and I'm willing to pay more for one that will last and look beautiful until I am ready for a new look. I am not saying there aren't some very nice synthetic rugs out there, there definitely are, but they will not be cheap either. Your rugs will be walked on, spilled on, crushed, and abused. Spend the money now instead of replacing it in a couple years! Please note that if I was going for a very trendy look that I knew I wouldn't want forever, I would most certainly pick out a cheaper Olefin or Poly rug and just give it away when I was ready for a change. But for the most part, my rugs are a long term commitment! Ugh I can't stand how much rugs cost! I decided to go with a high traffic approved carpet squares by Flor. Hopefully those will hold up for me. Great rug! I can't get over the cost either. I've had good luck with CSN rugs. FLOR carpet squares are a pretty cool product, and a good alternative to rugs. I know that large rugs cost a lot, but you can find some really great prices on PB and Crate and Barrel rugs on ebay. 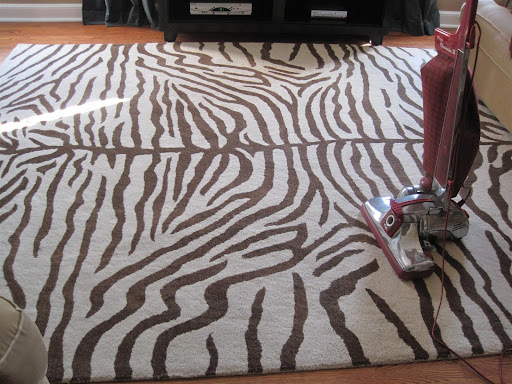 In fact, my zebra rug is discontinued, but you can find some on ebay still for way less than I paid! You made a great choice with that rug! Zebra print will never go out of style- you can just throw it in the guest room when you need a change. Estate sales are great places to find high quality rugs that (literally) last a lifetime, but don't cost a fortune. Your rug is fabulous and well worth the price! Your rug is fabulous and as you say "you get what you pay for". Wool will last forever. I was drooling over that rug in your last post... it looks great in your living room. I bought a wool rug on overstock.com - I hope it holds up as well as yours! Do your cats have claws still? I have to replace my bath mats every 6 months because they shred the crap out of them. I'm wondering how wool would hold up under the assault? Yay for the zebra rug-love!! 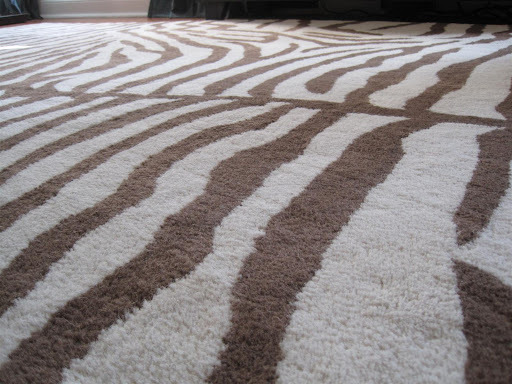 :) I'm totally with you on the quality and design of PB wools rugs - in addition to the zebra one, we have the moroccan tile print rug in our den and LOVE it!